Fit:HUSQVARNA: 36, 41, 136, 137, 141, 142. Pictures are accurate; you will get what you see in the picture. We will do our best to resolve the issue. Weight：20g. S hipping A ddress . Fit:HUSQVARNA 55 142 137 254 257 261 262 268 272 281 288 3120 Chainsaws. You can be assured to buy. What you see in the picture is what you will get. The item location is China. We will reply you within 24- 48 hours. 503 71 79-01 503 & 503 08 97-02. Fits Husqvarna Models Note: The real color of the item may be slightly different from the pictures shown on website caused by many factors such as brightness of your monitor and light brightness. We will help you to resolve the problem. You can be assured to buy. The item location is China. We will reply you within 24- 48 hours. For HUSQVARNA 136 137 141 142. 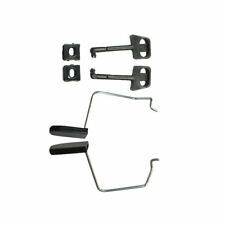 For HUSQVARNA 61 268 272. For HUSQVARNA 362 365 371 372. Carburetor Kit. Fits Husqvarna Cylinder Piston Kit. Clutch Parts. For PARTNER 350 351 370 371. FITS: HUSQVARNA 137 142 36 41 42 136 50 51 55 61 CHAINSAW. REPLACE OEM NUMBER: 503717901 1121 140 1915 1121 120 1617 0000 400 1300 1128 007 1000 537 81 27-01 503 26 03-01 505 27 57-192 503 26 03-01 505 27 57-192 537 81 27-01 503 26 03-01 505 27 57-192 503 26 03-01 505 27 57-192 8 503 71 82-01030 20055 030 20015 30 37-351 76 8-0258 7700 0000 350 3500. Fit: Husqvarna chainsaw 36, 41, 50, 51, 55, 61, 136, 137, 141，142 266, 268, 272, 340, 345, 394 and 395 models. You can be assured to buy. For Chinese45/52/58cc Chainsaw. For Husqvarna Parts. 137 (2004-10) Chainsaw 137 (2005-03) Chainsaw. 137 (2005-09) Chainsaw 137 (2006-01) Chainsaw. 137 (2006-12) Chainsaw 137 E (2004-10) Chainsaw. 137 E (2005-03) Chainsaw 137 E (2005-09) Chainsaw. If you have selected your goods, you will get high quality goods just as what you see in pictures.Each good is manually tested after it has been processed and produced. We will get back to you as soon as possible. 2 Choke Rod&2 Throttle Lever. Fit: For HUSQVARNA: 36, 41, 136, 137, 141, 142. Pictures are accurate; you will get what you see in the picture. We will do our best to resolve the issue. For Husqvarna 36 41 42 50 51 61 66 136 141 181 242 246 254 257 261 262 266 268 272 281 288 394 395 3120 and many Poulan Craftsman Models. 1 Kill Stop Switch. We will help you to resolve the problem. 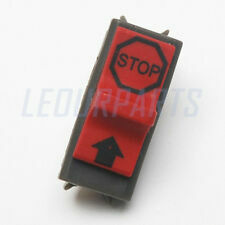 Fits for: For Husqvarna 36, 41, 42, 50, 51, 61, 66, 136, 141, 181, 242, 246, 254, 257, 261, 262, 266, 268, 272, 281, 288, 394, 395, 3120 and many Poulan Craftsman Models. 2pcs On-off Kill Switches. Can match with the original device perfectly. 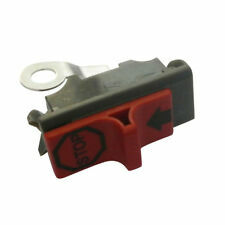 FITS: HUSQVARNA 137 142 36 41 42 136 50 51 55 61. REPLACE OEM#: 503717901. We will deal with you to solve any problems as soon as possible. 适用于:Husqvarna 36、41、42、50、51、61、66、136、141、181、242、246、254、257、261、262、266、268、272、281、288. 100%全新高品质. 坚固耐用,适用寿命长. 所有图片都经过专业校色,但由于所在环境以及不同显示设备设置不同,你所看到的图片和物品本身或许存在些许偏差,敬请谅解. Fit: HUSQVARNA: 36, 41, 136, 137, 141, 142. Fit: For HUSQVARNA 55 142 137 254 257 261 262 268 272 281 288 3120 Chainsaws. 2pcs Switch. Pictures are accurate; you will get what you see in the picture. Fit: For Husqvarna chainsaw 36, 41, 50, 51, 55, 61, 136, 137, 141，142 266, 268, 272, 340, 345, 394 and 395 models. Pictures are accurate; you will get what you see in the picture. We will do our best to resolve the issue. Fit:HUSQVARNA: 36, 41, 136, 137, 141, 142. What you see in the picture is what you will get. You can be assured to buy. Trending at C $4.83eBay determines this price through a machine-learned model of the product's sale prices within the last 90 days. Pictures are accurate; you will get what you see in the picture. Size: As Picture. Hope you can understand that. We will get back to you as soon as possible.